Hypersaline soil and pond water samples were mixed with 3 % crude oil, some samples were autoclaved to serve as sterile controls; experimental samples were not sterilized. After 6-week incubation at 40 °C under light/dark cycles, the soil microflora consumed 66 %, and after 4 weeks the pond water microflora consumed 63 % of the crude oil. Soil samples treated with 3 % casaminoacids lost 89 % of their oil after 6 weeks and water samples lost 86 % after 4 weeks. Samples treated with casaminoacids and antibiotics that selectively inhibited bacteria, lost even more oil, up to 94 %. Soil–water mixtures incubated under continuous illumination lost double as much more oil than samples incubated in the dark. 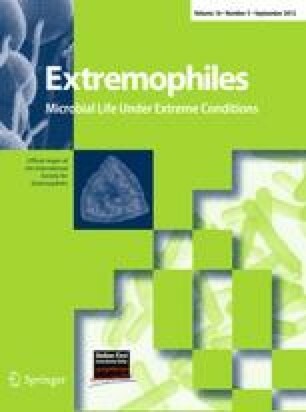 The soil–water mixture at time zero contained 1.3 × 104 CFU g−1 of hydrocarbon-utilizing microorganisms which were affiliated to Halomonas aquamarina, Exiguobacterium aurantiacum, Haloferax sp., Salinococcus sp., Marinococcus sp. and Halomonas sp. After 6-week incubation with oil, these numbers were 8.7 × 107 CFU g−1 and the Haloferax sp. proportion in the total microflora increased from 20 to 93 %. Experiments using the individual cultures and three other haloarchaea isolated earlier from the same site confirmed that casaminoacids and light enhanced their oil consumption potential in batch cultures. The work was supported by the University of Kuwait, Research Grant RS 01/12. Thanks are due to the SAF unit and GRF, Kuwait University for providing GLC (GS 02/01) and Genetic analyzer (GS 01/02) facilities.